CORAL GABLES, Fla. -- Gary Trent Jr. scored a season-high 30 points and No. 5-ranked Duke needed less than three minutes to erase a 13-point second-half deficit, scoring 18 consecutive points to overtake No. 25 Miami 83-75 on Monday night. The Blue Devils scored 15 points in only six possessions to rally, and the comeback included a trio of 3-pointers by Trent. He shot 9 for 14, including 6 for 9 from beyond the arc. Duke (16-2, 4-2 Atlantic Coast Conference) extended its winning streak against ranked teams to seven games, including four this season. Miami (13-4, 2-3) lost at home for the first time this season. Marvin Bagley III had 13 points and 12 rebounds for the Blue Devils, who shot 55 percent and won despite tying a season high with 19 turnovers. They committed none in the final 10 minutes as they rallied. Grayson Allen and the Duke Blue Devils toughed out a win at Miami on Monday night. The sellout crowd included 37 NBA scouts, Miami Heat owner Micky Arison, Alex Rodriguez and Jennifer Lopez. It also included Duke coach Mike Krzyzewski, back on the bench after missing Saturday's 89-71 victory over Wake Forest because of a virus. Krzyzewski's sport coat came off when the Hurricanes forced three turnovers during a 16-0 run that put them up 56-44. Duke went nearly eight minutes without a point, and Bagley missed four free throws during the drought. Lonnie Walker IV finished with 19 points for Miami. 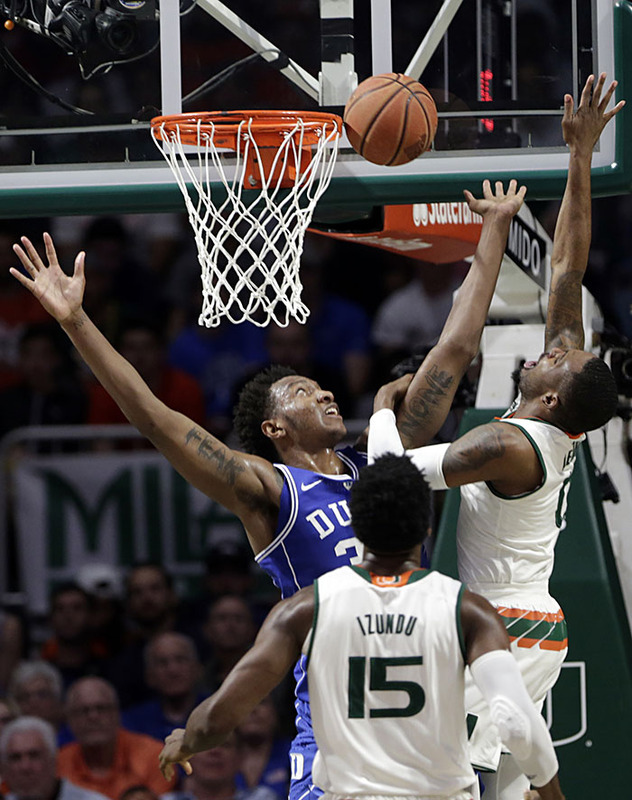 Dewan Huell added 18 points and 13 rebounds, but standout Miami guard Bruce Brown was held scoreless for the first 18 minutes and finished with seven points. 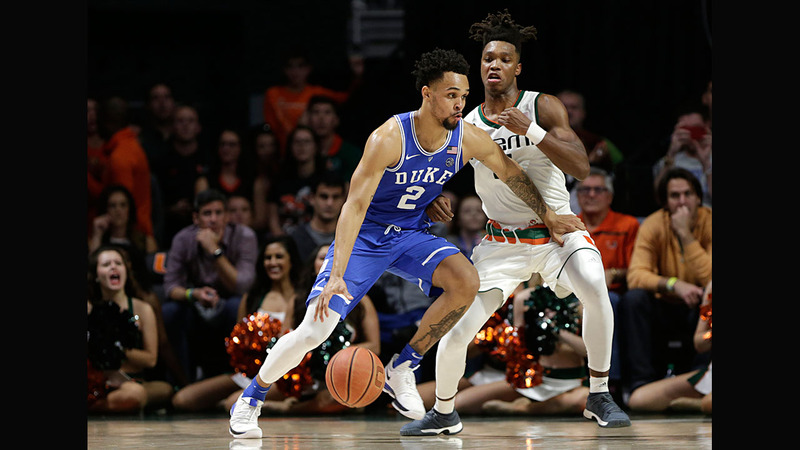 Smothering defense helped the Hurricanes outscore Duke 31-6 on fast-break points. They led 66-53 with eight minutes left, but the Blue Devils went on a 9-0 run on their next three possessions. Trent sank consecutive 3-pointers, and Bagley's three-point play made it 66-62. Wendell Carter drove for a basket to tie it at 66, and Trevon Duval's driving layup on Duke's next possession put them ahead with 4:40 left. The Blue Devils' lead reached 71-66 before Brown ended Miami's drought with a three-point play. Trent's final 3-pointer helped seal the win, putting Duke up 76-70 with 1:15 to go. Grayson Allen made a backcourt steal and fed Trent for a buzzer-beating 3-pointer to end the first half and give Duke a 42-40 lead. Duke came into the game second in the nation in scoring at 93.2 points per game, and Miami was fifth in scoring defense at 60.7 points. The Blue Devils played their third consecutive game without injured center Marques Bolden (sprained knee) and forward Javin DeLaurier (hamstring). Bagley gave Duke fans a scare when he left the game holding his right wrist in the early going, but he soon returned. Duke: Hosts Pittsburgh on Saturday. Miami: Visits N.C. State on Sunday.